Denon has added USB integration to the DN-D4500. The Numark CDN77USB is a Dual USB and MP3 CD player designed for professional DJs. CDN88 MP3 is a dual-deck unit that not only plays traditional CDs and MP3 CDs, but gives DJs capabilities not seen on many other rack-mount players, according to Numark. CDN22 MK5 is described as "a straightforward, dual-CD player for mobile DJs and club installs." 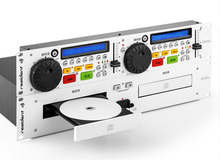 Gemini Introduces New Line of Professional CD/MP3/USB Players. American Audio has introduced two audio units designed specifically for use with SD cards: the SDJ-1 dual SD player; and the Q-SD, a 19" 4-channel mixer combined with an SD player.